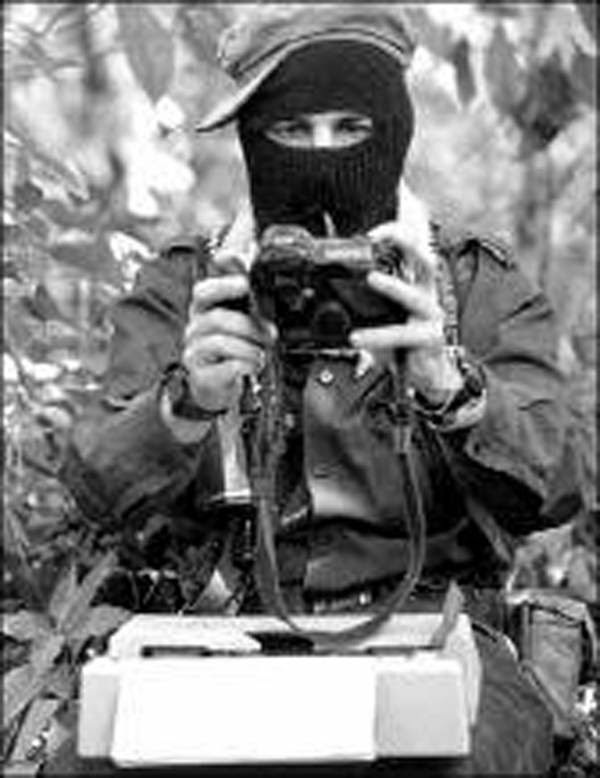 Interview conducted on August 5, 2014, in the afternoon (that is: after pozol), in the Zapatista community of La Realidad, in the mountains of southeastern Mexico. Climatological conditions: the heat was fierce, the skimasks were almost unbearable, but what can you do. M: My name is M.
Compañera: What is your work? M. I am an authority in this community of La Realidad. I am part of the ejidal commission of this community, La Realidad. Compañera: I have a question. How is the construction of the school going? 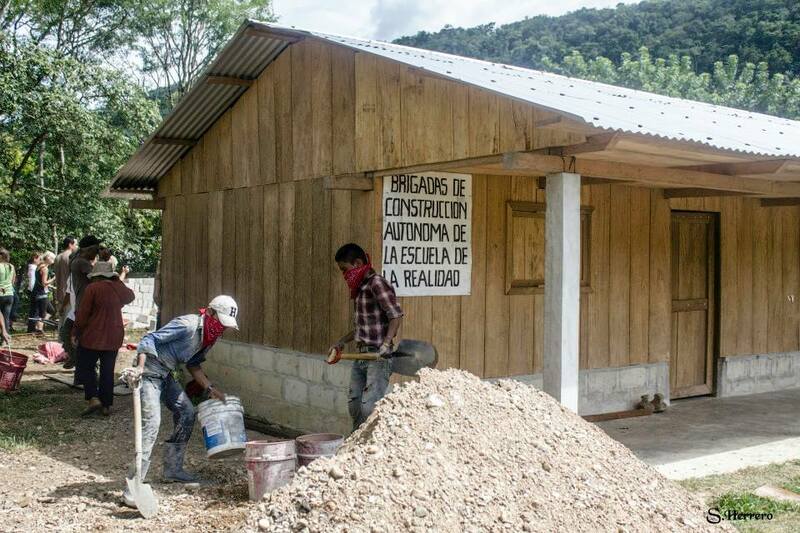 M: We began the construction of the school on the 31st of last month, and so it has only been going on for a few days. It hasn’t even been a week, it’s really just beginning. We are only just now starting with the installation of the iron bars, which are the primary base. The construction will require 25 or 26 bars altogether, and we have just finished installing six of them. This is what is currently happening with the construction; it has only just begun. It’s only been six days since we started. Compañera: What materials do you still need? M: We now have almost all of the materials that we need. We have already bought them from the hardware store; everything’s ready. All that we missing are some of the materials that haven’t yet arrived here in the community of La Realidad. That is, we already have all of the metal rods, the wire rods, all of that. Now we are waiting for the cement blocks to arrive – 430 sacks of cement and 9 bundles of laminate (Note: one bundle has ten sheets of laminate bundled into a single packet), and some nails for the construction of the house. That is what we are still waiting for here in the community in terms of materials. Most of the materials that we need are already here in La Realidad. Compañera: And when will the construction be finished? M: According to the masons here—the master builders—according to their calculations, it will take them 80 days to finish. That is how long the master builders have calculated; this is how long they have told us that it will take. Compañera: And how is the work organized? M: Well, here we organize our work such that we take turns. We take turns depending on how many helpers the master builders, the masons, need. If they say, ‘well this day I need 10 helpers, the next day I need 8,’ then we send the number of they ask for, taking turns. We might send 8 people today and another 8 a different day, and that is how it goes depending on how many people the master builder says that they need. That is how we are organized. It is the community of La Realidad who are doing the work here now; we are working and the masons, who arecompañeros, are directing the work. This is how it is organized. Compañera: How do you think the construction is going to turn out? M. Well, the master builders, the masons, asked us what we wanted the building to be like, what type of house we wanted built. So we told them how we wanted it to be, with two stories. We had someone who is an architect draw up a design according to what we said that we wanted. We have some of the drawings here for you to see, they show what it will be like, that is, the model or the type of house. And this is the type we chose. This drawing in my right hand is what it will look like from the front and in this one in in my left hand we are looking at it from the back. This is the model, how the house will look when the construction is finished. This is how we thought the building should be. Compañera: And this big building that we are looking at, what will it be used for? Compañera: Okay, very good compañero. Thanks so much for talking to us. Reporting for “The Odd Ones Out” [Los Tercios Compas]: Airwaves Insurgent compañera Angelina on microphone and Infantry Insurgent compañera Erika on camera. While we wait for official permissions from the Junta de Buen Gobierno, consensual and responsible reproduction is permitted, as is coronary circulation (it’s good for the heart) and the unobstructed rise and fall of what they call the upload and download.